Britain's first man in space has opened Portsmouth's newest college. 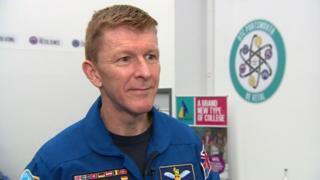 Sussex astronaut Tim Peake, who grew up in Chichester, returned to the city a year after receiving an honorary degree from the University of Portsmouth. Major Peake, who spent six months on the International Space Station earlier in 2016, studied flight dynamics and evaluation at the same university. He told students at the city's University Technical College that it was "great to be on home turf". "The most important subjects to study are those that inspire you and spark your curiosity to discover more," he said. It is hoped the college will boost the number of teenagers taking up science, technology, engineering and maths. Major Peake later tweeted he had met "some very impressive students". Image caption The astronaut said he had met "some very impressive students"
Major Peake set off on his six-month mission into space exactly two years ago, this week. During his mission, he completed the first spacewalk by a UK astronaut and ran an equivalent of the London Marathon. Speaking on Tuesday, he said the experience had left him with a "slightly changed perspective". "You get to see the Earth from a unique vantage point... you see how large space is and also how fragile our planet is. "We are actually a tiny life-supporting planet and we need to look after it." Major Peake currently works at the European Astronaut Centre in Cologne, Germany. "I look after the 10 active astronauts we have in the core, and I manage all the support that they need for their missions," he said.